Citizen journalist Michael Burns recently witnessed a large group of police shutting down a peaceful gathering near highway 27 in Broward County, Florida, at around 1:30 in the morning. Burns decided to stop and film the encounter, to provide some assistance to the victims who were at risk of having their rights violated by police. The police on the scene reacted very harshly with Burns, and told him that he was not allowed to film on public property. When the action in the area had died down, Burns decided to get the names and badge numbers of a few officers and head home. When he got into his car to leave, he was trailed by multiple officers, pulled over, and harassed. “As soon as I left, a Broward County Sheriff started following me. I slowed down to 15 under in the right lane but they kept behind me. Finally, as I was about to make a U-turn to head home, I was pulled over by the same officer that had kicked me off public property filming. 6 other cars pulled up surrounding my car during the stop. Deputy Paul Sada said the FOP badge on my plate was obstructing. I refused to answer any of his questioned and advised him I would see him in court to fight it when he told me I had to take it off,” Burns said. According to the police, Burns had modified his car or license plate in some way that made it difficult for them to read, and that was allegedly the reason why 6 cops cars had pulled him over that night. However, Burns believes that he was specifically targeted by police for attempting to record them and hold them accountable while on the job. After much harassment, Burns was ticketed for his supposed offense, and was able to return home. 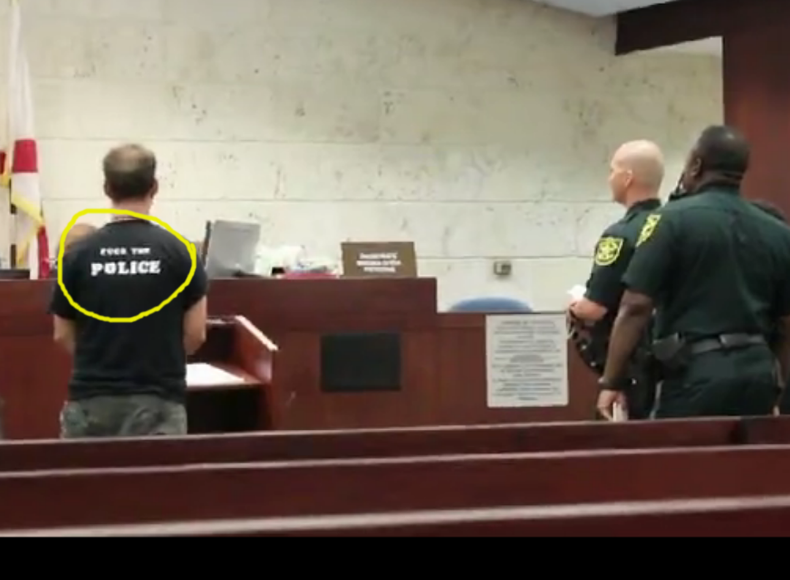 When Burns appeared in court to fight the ticket, he showed up wearing a shirt that said “F*%# The Police”, and attempted to invoke his 5th amendment right to remain silent, a motion that the judge denied. Still, Burns stood strong in his court appearance, against multiple officers, and actually was able to win his case.